Evaporative Cooling or Spilt Air Conditioning – Which one should you opt for? Home / Latest News / Evaporative Cooling or Spilt Air Conditioning – Which one should you opt for? The Australian Summer is here and with temperatures soaring up to the higher 30’s, the popular question doing the rounds is which cooling system should we opt for – Evaporative Cooling or Split System Air Conditioners. Here’s a quick snapshot of the advantages & disadvantages of both the systems. 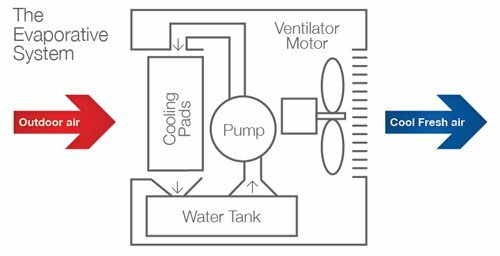 Evaporative Cooling works differently to air conditioners. A fan draws warm air from the outside through a series of wet filter pads. The air’s heat evaporates the water, cooling and humidifying the air, which is then blown into the house. Evaporative coolers are highly efficient and economical. The total investment required is lesser as compared to a traditional air conditioner. They cost less to install, operate and maintain as well. In addition to this, they only require a minimal seasonal maintenance. Evaporative coolers are also environmentally friendly as they use less energy. Evaporative coolers circulate outside air throughout your home which ensures that your air is fresh. As a result of this, the windows and doors can be left wide open too. If the humidity is high outside, the evaporative coolers become less efficient. They are mainly suited for areas with hot & dry climates and are not the best option for a city like Melbourne where all 4 seasons can be experienced in 1 day. As a result of this, they are not very popular even though they are cheaper to run. A Split AC consists of a compressor unit & an indoor unit. The compressor unit is installed outside the house & it is connected to one or more indoor air outlets. They are able to cool & heat one or more rooms of the house. Split AC’s can cool & heat up the room all-round the year however the weather maybe outside. With multiple Split AC units in different rooms, the temperature in each room can be controlled as required. This is unlike centralised cooling devices which can only maintain a set temperature in all selected areas. These are some of the reasons why they have become popular in the last few years. 30% of wasted energy in central air conditioning is lost through cracks in the duct work and other duct work problems. Since mini split air conditioners have no duct work they lose no energy. The cost of a split system itself & installation is expensive as compared to an evaporative cooling system. Regular maintenance is required & they also consume more energy. Want to know more about cooling solutions for your home or office? Contact Total Electric and Air Conditioning on 03 9729 0894 today. Based in Melbourne, we have been in the air conditioning and air conditioner installation industry for over 11 years. 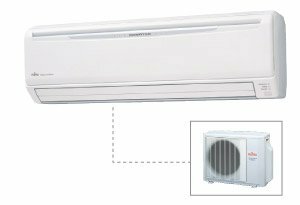 We specialise in a wide range of air conditioning needs which includes high wall split system inverters, multi-head split system inverters, refrigerated ducted systems, refrigerated cassette inverter systems and window box air conditioners.